Ford’s tagline ‘Built Ford Tough’ was introduced over 40 years ago and these words continue to excite loyal Ford fans but, more importantly, this phrase continues to represent what the Ford brand stands for: innovative, tough, and reliable automobiles. Ford to continue to be a leader in vehicle development which has enhanced both vehicle functionality and the driving experience. Wayne Pitman Ford is proud to announce the return of the Built Ford Tough Accessories program! When you purchase or lease any F-150 or Super Duty truck, between March 1st 2018 to April 30th 2018, Ford will provide a $1,000 discount towards purchases of $1,000 or more of select accessories! The Ford F150 is a perfect fit for a variety of lifestyles and Wayne Pitman Ford Lincoln has firsthand experience with the reliability and performance of this incredibly popular pick-up truck. -Conforms to the contours of the truck bed and integrates with all bed features. -Ribbed floor provides drainage and increases airflow between the bed and liner to reduce mold, mildew, and corrosion. -Skid resistant surface helps keep cargo in place. -Can be locked in full open position for access to the whole bed without removing the cover. -Hidden, quick-release latch system automatically locks panels when they’re shut — simply lock the tailgate to keep cargo locked and secure. -Rugged synthetic hinges and seals provide outstanding weather resistance. -Corrosion-resistant aluminum tubing is rugged yet lightweight. -Wide, slip resistant step pads made of plastic. -Easy to install; no drilling required. -Helps deflect mud, snow, and ice away from lower body panels. -Helps deflect stones and other debris. -Available in both moulded or flat. For our customers with more demanding vehicle needs, Wayne Pitman Ford Lincoln recommends the Ford Super Duty. 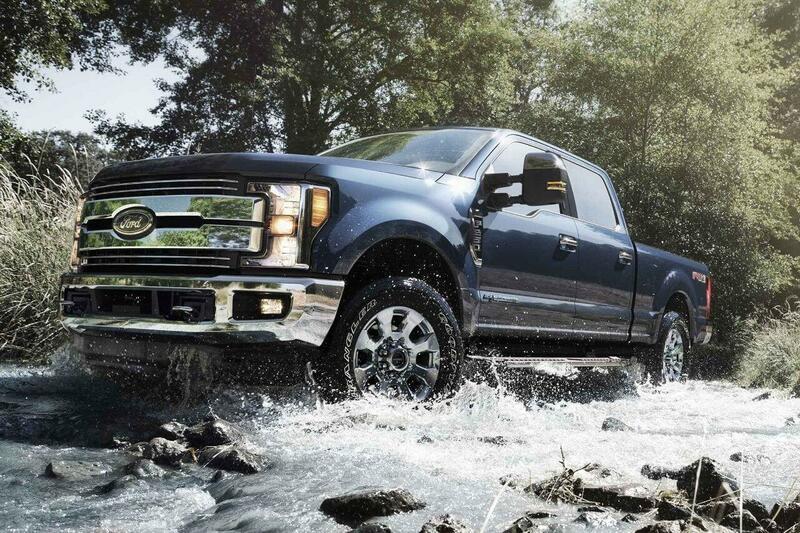 The Super Duty (F-250, F-350) features increased towing and payload capacity, and more powerful engine options. -Soft roll-up cover, available as Top Mount or Platinum inside Mount that features a single trigger latch. -Excellent weather sealing on all sides and corners. -Provides maximum protection from spills, dirt, and grime. -Constructed of durable, pliable, molded Thermoplastic Elastomer (TPE) providing a long life and perfect vehicle fitment. -Easy to clean — simply remove from vehicle and wash with soapy water. -Full set of premium locking cleats for your cargo bed . -Constructed of die-cast zinc with a heavy duty plastic housing and stainless steel lock assembly; black powder coating resists corrosion. There are a lot of exciting accessories in the 2018 Built Ford Tough Accessories program. Contact Wayne Pitman Ford to learn more, and come visit us to take one of our award-winning F-series trucks for a test drive!